A special solution which is able to wash out dried up lubricants in existing reel bearings. Also used before re-applying the Rocket Fuel during a bearing overhaul. This solution is not sold in Singapore. UK ordering and import is also not possible at the moment because this item does not conform to airmail regulation. Reasons is unknown to me. Fortunately, users can still use other solution like lighter fluid or petrol to the same effect. 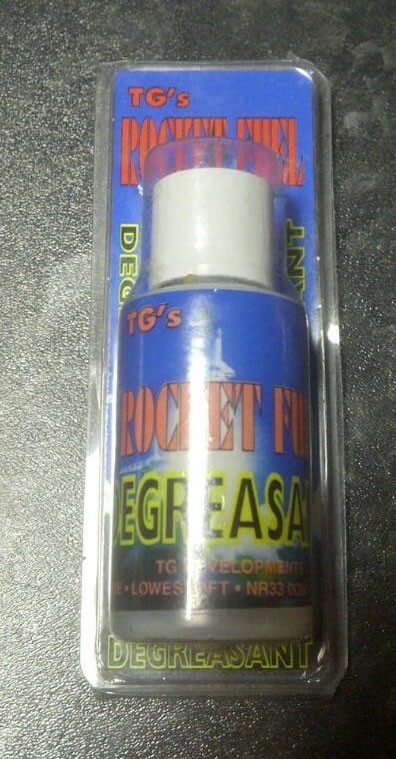 TG's Bearing Degreaser. A special solution which is able to wash out dried up lubricants in existing reel bearings. Also used before re-applying the Rocket Fuel during a bearing overhaul. This solution is not sold in Singapore. UK ordering and import is also not possible at the moment because this item does not conform to airmail regulation. Reasons is unknown to me. Fortunately, users can still use other solution like lighter fluid or petrol to the same effect. Looking to buy some Reel Grease / Oil as part of a fishing gift? If you would like some advice on purchasing Reel Grease / Oil, simply contact our expert fishing team, giving us either an email or phone number on which to contact you and we'll get back to you right away with the best advice and prices. FREE Delivery on all Daiwa Reel Grease / Oil over £100!! !